There are two ceremonies involving sacred thread in India (that I know of). One celebrates the relationship between brothers and sisters and another the relationship between a boy and his spiritual identity. Raksha Bandhan or the bond of protection is an annual festival in India. During the related ceremony sisters tie a sacred thread, or rakhi, around their brothers wrist. This act symbolises the sisters wish for her brothers well-being as well as the brothers responsibility to protect his sister. The sacred thread ceremony or Upanayana is an initiation ceremony wherein a boy accepts a spiritual identity and teacher. The Jenoi (sacred thread) is tied around the initiated boy’s wrist. In both instances the sacred thread is worn by a male and reminds him of his responsibilities whether related to his spiritual integrity or his brotherly responsibilities. Women may tie the thread but do not wear it. 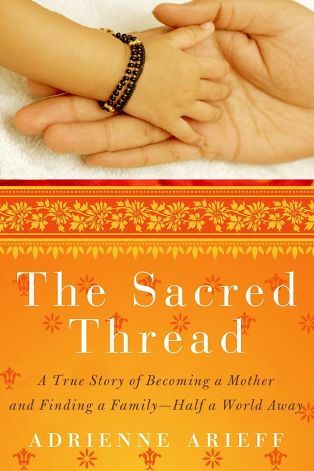 So, it is interesting that a new book on an IP experience of surrogacy in India is titled the Sacred Thread. The author, Adrienne Arieff describes her unusual journey into motherhood. Unlike most IPs who become parents through surrogacy in India, Arieff was able to move to Anand in Gujurat for the duration of the pregnancy and spend time with Vaina, her children’s surrogate. I love the idea of claiming the very male symbol of the sacred thread to describe the relationship between herself and Vaina as well as that between Vaina and the authors children. I can not think of a thread more sacred than the life giving umbilical cord – I love that this notion weaves itself into the imagery of the title.